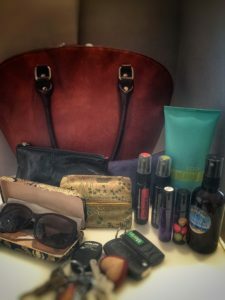 Does your handbag or workbag need an overhaul? You're loving using your essential oils, aren't you! 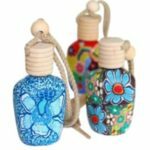 But, let's face it, they can be a bit bulky to take around with you in your handbag, car or workbag. Or maybe you haven't discovered essential oils yet. You haven't exclaimed with joy at the difference they're making to your health and wellbeing. Does your handbag look like this? Are you like me and seem to have so much stuff in your handbag, it's hard to cram in those essential health support items? Well, then why not make some on-the-go travel-sized products to take around with you: lighter, handier, and easier? Whether you're already using essential oils or would like to learn about how they can support your health and wellbeing while having fun making some products with them, then this make'n'take workshop will give you an insight to the wonderful world of essential oils while you enjoy making just what you need to have your go-to support products always with you. Your handbag (and your shoulders) will thank you. What a cute little car diffuser! And you'll get a handy little carry pouch to put them in! Cost is $30 and includes all containers, ingredients, labels and a recipe booklet. Additonal containers will be available for purchase at the workshop. Cash or credit card accepted or book via the Eventbrite here. Further information, FAQs, and terms and conditions, can be found on the Eventbrite booking site here. If you have any questions, or wish to provide dietary requirements, please contact me here.